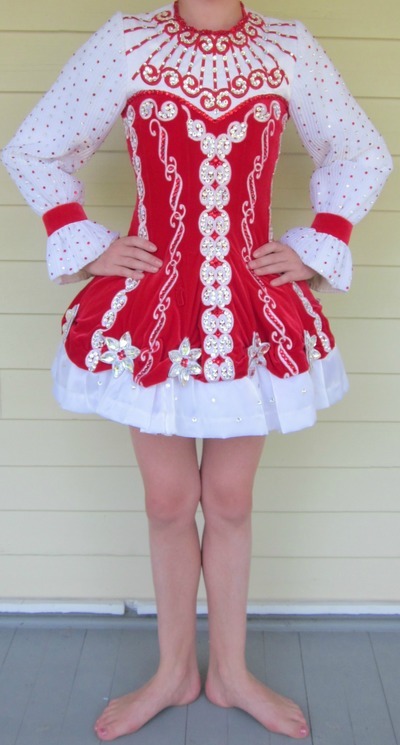 REDUCED Currently shown on the Siopa Rince website. Red stretch velvet with white twinkle satin. Thousands of Swarovski Crystals including large teardrop flowers. Toole under ballerina skirt. Moves beautifully on stage. Plenty of room for adjustment. Seamstress owned; wonderful condition. Room to let down sleeves further. Dress length is currently let down, but can easily be taken up with a simple hem. This dress is a princess style which tapers at the waist, but does not have an actual waistline. Built in bloomers. Asking Price: $US850.00 OBO. Shipping costs are included for my own country, overseas shipping is extra. Returns are negotiable.